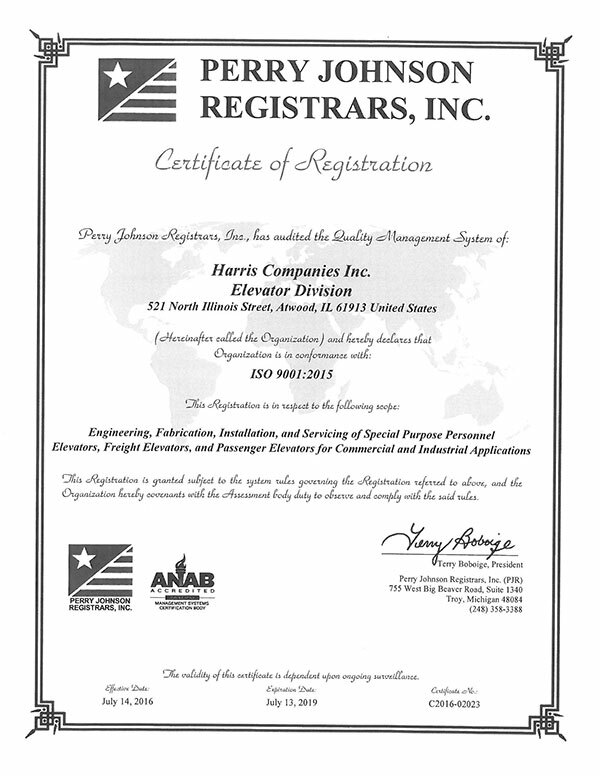 July 2017 – Harris Companies Inc.
We provide routine safety inspection, annual or five year testing to meet applicable requirements of special purpose personnel elevators, freight elevators and hand powered elevators. Through our maintenance programs, problems are often detected before conditions become a safety hazard to you, your employees and property. Whether you prefer monthly, semi-annual or annual testing, we can meet your service needs. We pride ourselves in top quality installation and repair of your special purpose personnel elevators,freight elevators and hand powered elevators. We replace hardwired relay logic control systems with programmable logic controllers for flexibility and future growth. We provide sales, installation and service of temperature cable systems designed to monitor the temperature of any bulk commodity. Providing sales, installation and service of hazardous monitoring systems, including hot bearing, belt alignment, motion sensing and bin level.